Q: Does my primary health insurance company provide me with the $10,000 medical coverage I want to ride without a helmet? A: No, not in most cases. 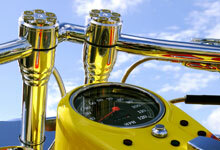 Most major medical plans exclude injuries do to operation of motorcycles. Q: Can I carry theft coverage without carrying collision? A: Yes you can. We have numerous companies that we represent that will allow you to carry the Comprehensive without Collision. Q: My lien holder only requires me to carry comprehensive and collision; do I have to carry Bodily Injury and Property Damage? A: Yes. There are no companies offering stand-alone comprehensive and collision. Policies must contain a minimum liability benefit. Q: If I am in an accident and the other person is at fault and is uninsured, will my uninsured motorist pay out to fix my motorcycle? A: No it will not. That coverage is offered under comprehensive and collision coverage subject to your selected deductible.